By promoting academic freedom thought, Kyoto University aims to boldly approach solutions to multiple problems, and to contribute to peaceful coexistence between the peoples of the world.To achieve this aim, we must succeed in 3 primary missions; (1) education which fosters talent via “knowledge transmission”; (2) research which implements “knowledge creation” to address cutting-edge research topics; and (3) contribute to society via education and research activities that bring value to mankind. 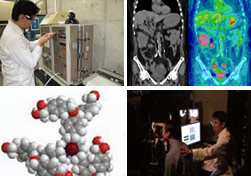 The project between Kyoto University and Canon “Innovative Techno-hub for Integrated Medical Bio-imaging” named CK project was started in 2006 and is expected to continue on a 10-year plan supported by the MEXT Budget for the Promotion of Science and Technology as part of the Creation of innovation centers for advanced interdisciplinary research areas program. It is a good example of education and research activities that put the University’s ideals into concrete practice, and we hope that by performing cutting-edge research and fostering talent we will contribute to creating the “healthy society” that is sought by all of humanity. A unique and exclusive university-company partnership model has driven this project. From the outset, professors at Kyoto University and members of Canon’s development department have held vigorous discussions on an equal standing to unite technology and practical application. By combining Kyoto University’s background in integrated science and technology and its excellent record in clinical research with Canon’s technical strengths in product development, the drive to achieve innovation in medical treatment has become a pillar of this work. In the medical sphere today, it is commonly known that leading medical treatment relies on a handful of imagingdiagnosis modalities. If we consider novel developments in science and technology and the spread of IT technologies, we can see that we are in a position to create the next modality. In this project, we have a long-term aim to propose and realize such a novel imaging-diagnosis technique, modality “X”.